There's something about stuffing vegetables that really makes them a worthy centerpiece dish. I've also always had a soft spot for using real food as the serving vessel, such as the rind of the squash in this case. This is one of those just plain nourishing recipes, filled with whole grains, whole veggies and not a lot of extra fat. 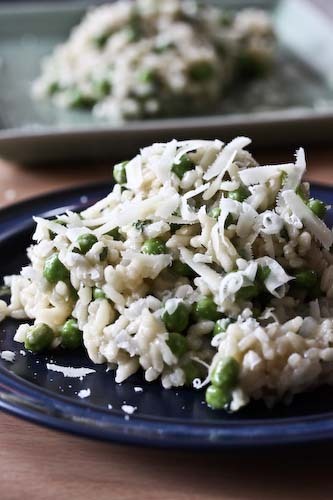 The recipe is based on one from Robin Asbell's beautiful The New Whole Grains Cookbook, in which she concentrates on such grains as farro, quinoa, brown rice, and barley, among others, and explores ways to put them to work for each and every meal of the day from breakfast and desserts to sides and main dishes. Most recipes are also accompanied by a lovely color photograph, which is always a plus in my book. If you don't happen to have the grain she calls for, she usually provides whole grain substitutes, so that no recipe is undoable based on availability. As might be expected, the focus is not just on whole grains, but on whole foods, in general. Ms. Asbell is coming out with a vegetarian cookbook this fall, and if she's able to make whole grains so amazingly tasty, imagine what she's going to do with everything else! I can't wait. I did change this recipe around a bit, however. I substituted quinoa for the wild rice because I happen to be addicted to the stuff, and because Asbell says that's okay. I also used hazelnuts instead of pecans because I had them, and, well, I'm cheap. Oven preheated to 400, grease a baking sheet, cut your squash in half the long way, remove the seeds and bake, cut side down, for 20-30 minutes. Let the squash cool and reduce the oven to 375. I used a 2-quart sauce pan to cook the quinoa, which is only slightly different from cooking rice. Just use 1 parts quinoa to 2 parts water, so in this case 1/2 cup quinoa and 1 cup water. Add both to the pot, and bring the water to a boil. Once it's boiling, reduce the heat to a simmer (low heat), cover and allow to cook 10-15 minutes. Mine took 12. In a small pan, heat the olive oil over medium heat and cook the celery, onion(s) and sage until softened. Stir in the parsley, marjoram, pepper, nutmeg and salt, cook briefly then remove from the heat. Once the squash has cooled, scoop out the insides into a large bowl. Leave enough of the shell intact to hold its shape and the filling. 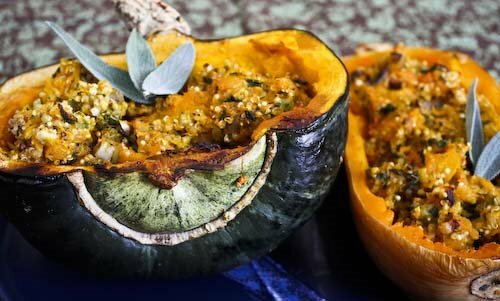 Mash the squash with a fork or potato masher and mix it with the cooked quinoa and the sautéed mixture. Add the nuts. Stuff the mixture back into the squash shells, top with any reserved nuts and return to the oven for another 30 minutes, or until the stuffing is firm. Done! 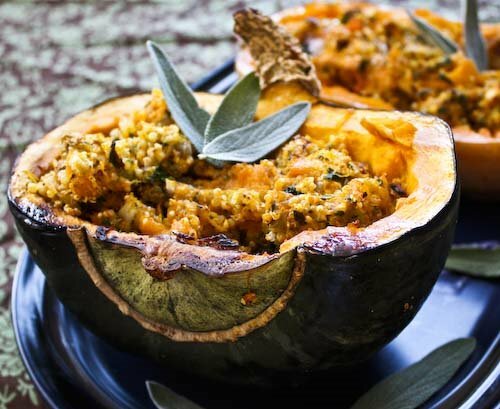 Thanks for making the stuffed squash- I can't tell you how many hundreds of them I made in my days in the restaurant kitchen, trying out every grain. I'm working on my follow-up book, the New Vegetarian Cookbook, to come out in Fall 09. 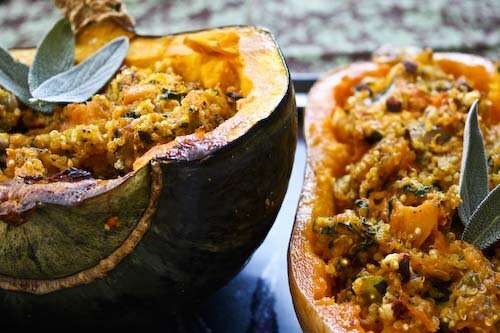 Your squash looks/sounds amazing! I love quinoa as well and I'm always on the hunt for new recipes that include the fabulous grain. I am bookmarking your recipe for use in the very near future! As for the cookbook, I must check it out - sounds right up my alley! This looks really tasty. 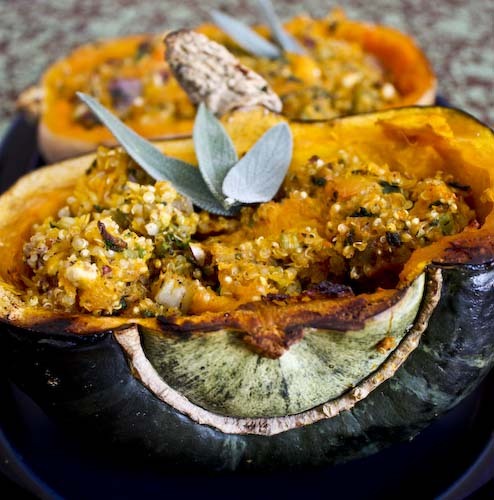 I really like how you've used the squash rind as the serving vessel - that always looks great. 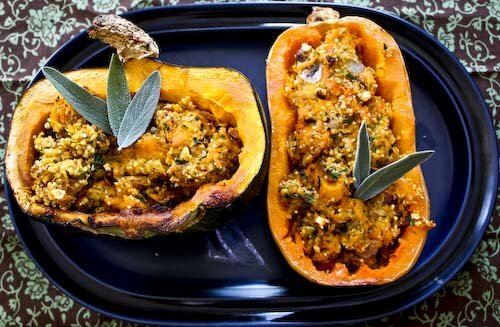 I agree - stuffed squash and veggies are beautiful! They make for a delicious presentation. This looks like an amazing fall dish. I love the presentation, it looks great. Sounds delicious too! That looks good! Great presentation serving it in the squash. Hi Robin, thank YOU for the great recipes! I've loved them all! Running with food, if you love quinoa definitely check out Robin's book. I love the stuff! Fearless Kitchen, Hillary, Kevin and Sam: and the best part is, serving it in the shell makes for fewer dishes (in theory!). Christine, thanks for stopping by! I love fall food, so this was pretty great. This looks *so* delicious, and quintessentially fall! Going to make it with an acorn squash I have. YUM. This looks absolutely wonderful. I've never stuffed a squash, but you make it sound eminently doable. And I know Robin so I'm even more excited to see her recipe here! Beautiful photos, too. This looks great! I love Robin's cookbook and will be making this recipe. Beautiful. 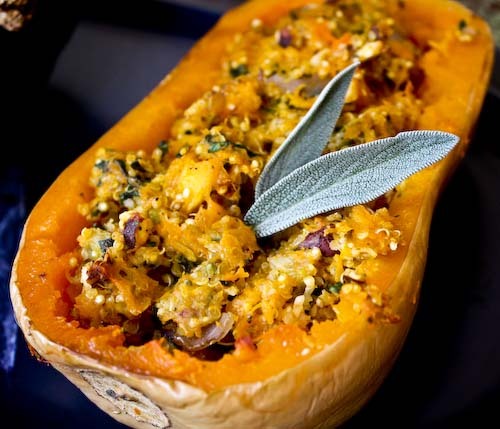 Love squash and it just gets better with a filling. I made this the other week - it was just outstanding! Definitely going to be a favorite fall dish going forward. Thanks for the recipe! Really really delicious. My guests were impressed and it was really nice that m gluten-free friend was able to eat with us. The only thing I will change the second time around is use less dried marjorum. I found it a little overpowering and next time will use just half a teaspoon. Thanks for a great recipe!